This week's 100 word story based on the following picture prompt. I gently push open the door and tentatively enter. I need to see this for myself. The house, my sanctuary, has been turned upside down. Absolutely nothing has been left untouched. I feel sick as I make my way to the kitchen. 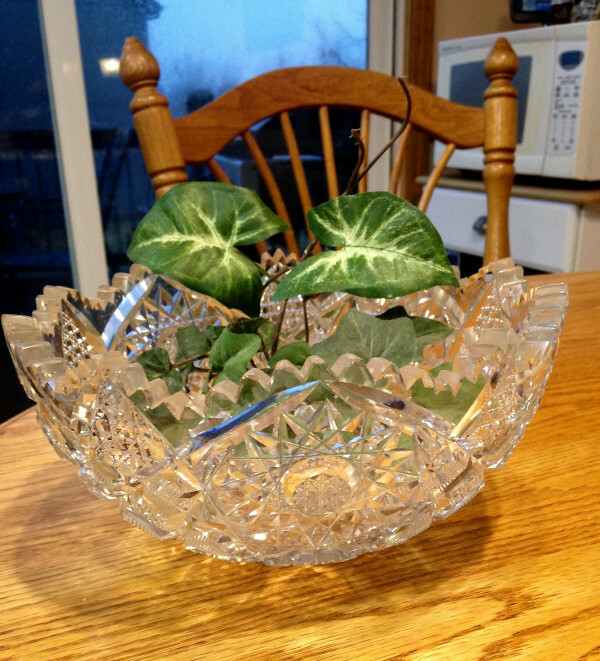 The mouth-wateringly expensive, stunning crystal bowl, a precious wedding gift that takes pride of place on the dining table, is cracked. A strange sticky residue lines the edges. My favourite plant, mutilated, leaves carelessly tossed aside. Devastated at the damage, I take a deep, angry, breath before calling upstairs. The thought of the bowl with a crack in it leaves me feeling sick, too. Then you turned the story on its head with the last line. Well done. It's funny how many stories about domestic (or other) violence have been inspired by this simple image. Well written, Bettina. You make the loss and damage feel personal. You create a sense of desecration about the damage, because the house is the narrator's sanctuary. I wonder what did happen. One of your best, Bettina. Very well done. Kids! They have so little respect for parents' property sometimes. Well written. Very vivid story. Chloe has some explaining to do, I think, Jilly, Sugar on the Bee. I thought it was vandals...then found out it was Chloe. Yikes! Good job.